The Fall Children’s Vegetable Garden started growing this past weekend! As always, we’ve got a great group of eager young gardeners, some returning and some new to the program. Look at those empty beds! But if you look closer, there are tomatoes in their pots ready to be planted. Remember to apply granular fertilizer by sprinkling it low to the ground so you get it where you want it, not where the wind wants it. Then scratch it in lightly with a rake or hand cultivator, depending on the size of your bed. We do not disturb the soil deeply or till these beds…basically, doing that will create more work for you by disturbing deeply buried weed seeds which might germinate once they are closer or on top of the soil. This will create more weeding work for you and, personally, I’d rather keep weeding to a minimum. I’m lazy like that. Here’s a shot of our section discussing fertilizer, and you can see the rakes we used leaning up against the table. Next our gardeners planted their tomato plants, one Tycoon and one BHN 968 Dwarf Cherry Surprise. When picking out transplants at the nursery, I prefer to pick ones with nice strong stems and no root mass outside the bottom of the pot. Our plants were all very strong, healthy plants…you’ll see them in the next few pictures. Dusted the hole with rock phosphate and mixed fertilizer with the soil we dug from the hole (see agenda for details). Used the same soil we dug to fill the hole back in. Sometimes people will use a premium potting soil to fill the hole in, thinking it will give the plant a better start, but it is better to use the same soil you dug out when you plant in the ground otherwise the roots will have trouble making the transition from a lighter soil to a heavier soil and will not spread beyond the hole as easily. Then our gardeners mulched, and created a berm (ridge) of mulch around the tomatoes, as in the picture above. She is putting down 2-3” of mulch, keeping it away from the stem. We water by hand because it is water-wise to direct the water where it is needed, and it is a great way to settle the mulch down. After a bit more fertilizer (Hasta-Gro this time), and a final watering, we checked our work; particularly making sure the tomato cages were well anchored (we used rebar in a candy-cane shape—you can see one in the front of the cage in the pic above). At the end of the day, we had our first plants of the Fall season settled in their beds and all nicely lined up too! Fantastic job, gardeners! Ah, yes…my extra pic this week is a view from the garden…as a native New Yorker, I am still amazed by Texas skies, and you can also see the two gorgeous huge rosemary plantings in the perimeter beds. Yep, they are taller than the fence. An easy, decorative, and useful herb to consider for your yard. Your local nursery will have a variety of selections for you to choose from. 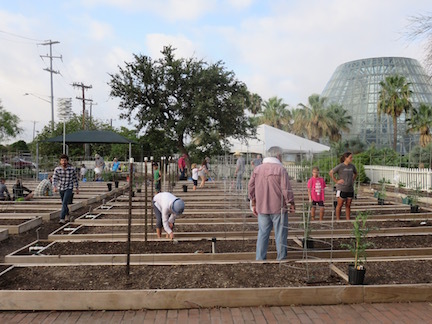 Come join us this September for the Fall Youth Gardens Educator training class! 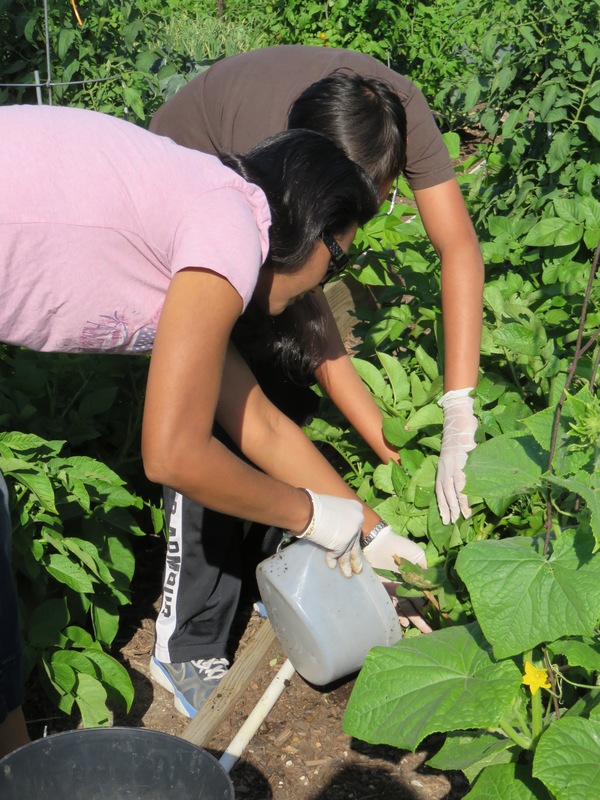 This training is designed for teachers, educators, and volunteers in support of Youth Gardening in the classroom and community. If you are interested in starting a gardening program in your school/community or you are looking for a ways to enhance your already existing Youth Garden, do not miss this educational opportunity! Breakout sessions will be conducted with different garden topics for you to choose from. Plant materials will be distributed to participants who complete this training and enroll in the Classroom Gardens Program. (Plant material is given per school/institution). Training and lunch is provided at no cost to all participants. Certificates & CPE hours (5 credits) will be awarded for completion of this program.